Welcome to the report describing Project Rephetio and Hetionet v1.0. The formal title of this study is Systematic integration of biomedical knowledge prioritizes drugs for repurposing. The shortDOI for this project is https://doi.org/bszr. It's also available as a peer-reviewed research article at eLife and as preprint on bioRxiv . The markdown source for the report is available on GitHub, where feedback via Issues is also welcome. The ability to computationally predict whether a compound treats a disease would improve the economy and success rate of drug approval. This study describes Project Rephetio to systematically model drug efficacy based on 755 existing treatments. First, we constructed Hetionet (neo4j.het.io), an integrative network encoding knowledge from millions of biomedical studies. Hetionet v1.0 consists of 47,031 nodes of 11 types and 2,250,197 relationships of 24 types. Data was integrated from 29 public resources to connect compounds, diseases, genes, anatomies, pathways, biological processes, molecular functions, cellular components, pharmacologic classes, side effects, and symptoms. Next, we identified network patterns that distinguish treatments from non-treatments. Then we predicted the probability of treatment for 209,168 compound–disease pairs (het.io/repurpose). Our predictions validated on two external sets of treatment and provided pharmacological insights on epilepsy, suggesting they will help prioritize drug repurposing candidates. This study was entirely open and received realtime feedback from 40 community members. The cost of developing a new therapeutic drug has been estimated at 1.4 billion dollars , the process typically takes 15 years from lead compound to market , and the likelihood of success is stunningly low . Strikingly, the costs have been doubling every 9 years since 1970, a sort of inverse Moore's law, which is far from an optimal strategy from both a business and public health perspective . Drug repurposing — identifying novel uses for existing therapeutics — can drastically reduce the duration, failure rates, and costs of approval . These benefits stem from the rich preexisting information on approved drugs, including extensive toxicology profiling performed during development, preclinical models, clinical trials, and postmarketing surveillance. Drug repurposing is poised to become more efficient as mining of electronic health records (EHRs) to retrospectively assess the effect of drugs gains feasibility [6, 7, 8, 9]. However, systematic approaches to repurpose drugs based on mining EHRs alone will likely lack power due to multiple testing. Similar to the approach followed to increase the power of genome-wide association studies (GWAS) [10, 11], integration of biological knowledge to prioritize drug repurposing will help overcome limited EHR sample size and data quality. In addition to repurposing, several other paradigm shifts in drug development have been proposed to improve efficiency. Since small molecules tend to bind to many targets, polypharmacology aims to find synergy in the multiple effects of a drug . Network pharmacology assumes diseases consist of a multitude of molecular alterations resulting in a robust disease state. Network pharmacology seeks to uncover multiple points of intervention into a specific pathophysiological state that together rehabilitate an otherwise resilient disease process [13, 14]. Although target-centric drug discovery has dominated the field for decades, phenotypic screens have more recently resulted in a comparatively higher number of first-in-class small molecules . Recent technological advances have enabled a new paradigm in which mid- to high-throughput assessment of intermediate phenotypes, such as the molecular response to drugs, is replacing the classic target discovery approach [16, 17, 18]. Furthermore, integration of multiple channels of evidence, particularly diverse types of data, can overcome the limitations and weak performance inherent to data of a single domain . Modern computational approaches offer a convenient platform to tie these developments together as the reduced cost and increased velocity of in silico experimentation massively lowers the barriers to entry and price of failure [20, 21]. Hetnets (short for heterogeneous networks) are networks with multiple types of nodes and relationships. They offer an intuitive, versatile, and powerful structure for data integration by aggregating graphs for each relationship type onto common nodes. In this study, we developed a hetnet (Hetionet v1.0) by integrating knowledge and experimental findings from decades of biomedical research spanning millions of publications. We adapted an algorithm originally developed for social network analysis and applied it to Hetionet v1.0 to identify patterns of efficacy and predict new uses for drugs. The algorithm performs edge prediction through a machine learning framework that accommodates the breadth and depth of information contained in Hetionet v1.0 [22, 23]. Our approach represents an in silico implementation of network pharmacology that natively incorporates polypharmacology and high-throughput phenotypic screening. One fundamental characteristic of our method is that it learns and evaluates itself on existing medical indications (i.e. a "gold standard"). Next, we introduce previous approaches that also performed comprehensive evaluation on existing treatments. A 2011 study, named PREDICT, compiled 1,933 treatments between 593 drugs and 313 diseases . Starting from the premise that similar drugs treat similar diseases, PREDICT trained a classifier that incorporates 5 types of drug-drug and 2 types of disease-disease similarity. A 2014 study compiled 890 treatments between 152 drugs and 145 diseases with transcriptional signatures . The authors found that compounds triggering an opposing transcriptional response to the disease were more likely to be treatments, although this effect was weak and limited to cancers. A 2016 study compiled 402 treatments between 238 drugs and 78 diseases and used a single proximity score — the average shortest path distance between a drug's targets and disease's associated proteins on the interactome — as a classifier . We build on these successes by creating a framework for incorporating the effects of any biological relationship into the prediction of whether a drug treats a disease. By doing this, we were able to capture a multitude of effects that have been suggested as influential for drug repurposing including drug-drug similarity [24, 27], disease-disease similarity [24, 28], transcriptional signatures [25, 29, 17, 30, 18], protein interactions , genetic association [31, 32], drug side effects [33, 34], disease symptoms , and molecular pathways . Our ability to create such an integrative model of drug efficacy relies on the hetnet data structure to unite diverse information. On Hetionet v1.0, our algorithm learns which types of compound–disease paths discriminate treatments from non-treatments in order to predict the probability that a compound treats a disease. We refer to this study as Project Rephetio (pronounced as rep-het-ee-oh). Both Rephetio and Hetionet are portmanteaus combining the words repurpose, heterogeneous, and network with the URL het.io. We obtained and integrated data from 29 publicly available resources to create Hetionet v1.0 (Figure 1). The hetnet contains 47,031 nodes of 11 types (Table 1) and 2,250,197 relationships of 24 types (Table 2). The nodes consist of 1,552 small molecule compounds and 137 complex diseases, as well as genes, anatomies, pathways, biological processes, molecular functions, cellular components, perturbations, pharmacologic classes, drug side effects, and disease symptoms. The edges represent relationships between these nodes and encompass the collective knowledge produced by millions of studies over the last half century. A) The metagraph, a schema of the network types. B) The hetnet visualized. Nodes are drawn as dots and laid out orbitally, thus forming circles. Edges are colored by type. C) Metapath counts by path length. The number of different types of paths of a given length that connect two node types is shown. For example, the top-left tile in the Length 1 panel denotes that Anatomy nodes are not connected to themselves (i.e. no edges connect nodes of this type between themselves). However, the bottom-left tile of the Length 4 panel denotes that 88 types of length-four paths connect Symptom to Anatomy nodes. For example, Compound–binds–Gene edges represent when a compound binds to a protein encoded by a gene. This information has been extracted from the literature by human curators and compiled into databases such as DrugBank, ChEMBL, DrugCentral, and BindingDB. We combined these databases to create 11,571 binding edges between 1,389 compounds and 1,689 genes. These edges were compiled from 10,646 distinct publications, which Hetionet binding edges reference as an attribute. Binding edges represent a comprehensive catalog constructed from low throughput experimentation. However, we also integrated findings from high throughput technologies — many of which have only recently become available. For example, we generated consensus transcriptional signatures for compounds in LINCS L1000 and diseases in STARGEO. Hetionet v1.0 includes 11 node types (metanodes). For each metanode, this table shows the abbreviation, number of nodes, number of nodes without any edges, and the number of metaedges connecting the metanode. Hetionet v1.0 contains 24 edge types (metaedges). For each metaedge, the table reports the abbreviation, the number of edges, the number of source nodes connected by the edges, and the number of target nodes connected by the edges. Note that all metaedges besides Gene→regulates→Gene are undirected. The query above identifies genes that interact with MS GWAS-genes. However, interacting genes are discarded unless they are upregulated in an MS-related anatomy (i.e. anatomical structure, e.g. organ or tissue). Then relevant biological processes are identified. Thus, this single query spans 4 node and 5 relationship types. The integrative potential of Hetionet v1.0 is reflected by its connectivity. Among the 11 metanodes, there are 66 possible source–target pairs. However, only 11 of them have at least one direct connection. In contrast, for paths of length 2, 50 pairs have connectivity (paths types that start on the source node type and end on the target node type, see Figure 1C). At length 3, all 66 pairs are connected. At length 4, the source–target pair with the fewest types of connectivity (Side Effect to Symptom) has 13 metapaths, while the pair with the most connectivity types (Gene to Gene) has 3,542 pairs. 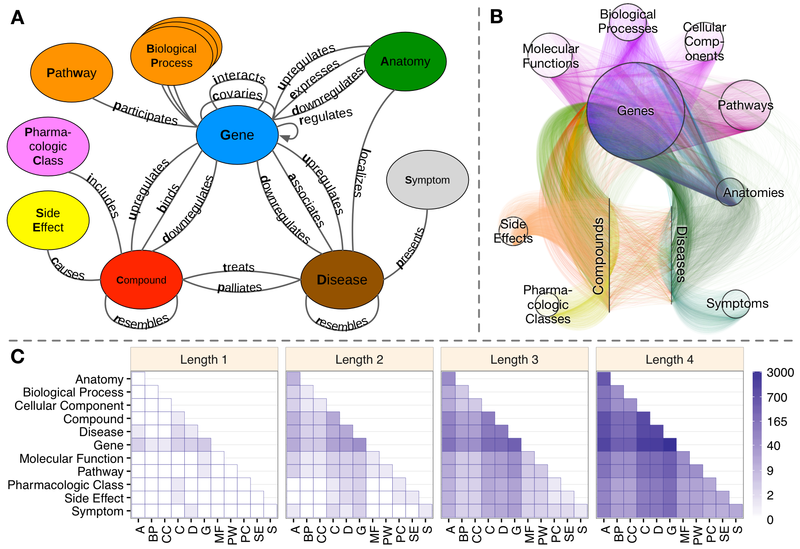 This high level of connectivity across a diversity of biomedical entities forms the foundation for automated translation of knowledge into biomedical insight. Hetionet v1.0 is accessible via a Neo4j Browser at https://neo4j.het.io. This public Neo4j instance provides users an installation-free method to query and visualize the network. The Browser contains a tutorial guide as well as guides with the details of each Project Rephetio prediction. Hetionet v1.0 is also available for download in JSON, Neo4j, and TSV formats . The JSON and Neo4j database formats include node and edge properties — such as URLs, source and license information, and confidence scores — and are thus recommended. One aim of Project Rephetio was to systematically evaluate how drugs exert their therapeutic potential. To address this question, we compiled a gold standard of 755 disease-modifying indications, which form the Compound–treats–Disease edges in Hetionet v1.0. Next, we identified types of paths (metapaths) that occurred more frequently between treatments than non-treatments (any compound–disease pair that is not a treatment). The advantage of this approach is that metapaths naturally correspond to mechanisms of pharmacological efficacy. For example, the Compound–binds–Gene–associates–Disease (CbGaD) metapath identifies when a drug binds to a protein corresponding to a gene involved in the disease. We evaluated all 1,206 metapaths that traverse from compound to disease and have length of 2–4 (Figure 2A). To control for the different degrees of nodes, we used the degree-weighted path count (DWPC, see Methods) — which downweights paths going through highly-connected nodes  — to assess path prevalence. In addition, we compared the performance of each metapath to a baseline computed from permuted networks. Hetnet permutation preserves node degree while eliminating edge specificity, allowing us to isolate the portion of unpermuted metapath performance resulting from actual network paths. We refer to the permutation-adjusted performance measure as Δ AUROC. A positive Δ AUROC indicates that paths of the given type tended to occur more frequently between treatments than non-treatments, after accounting for different levels of connectivity (node degrees) in the hetnet. In general terms, Δ AUROC assesses whether paths of a given type were informative of drug efficacy. A) The performance of the DWPCs for 1,206 metapaths, organized by their composing metaedges. The larger dots represent metapaths that were significantly affected by permutation (false discovery rate < 5%). Metaedges are ordered by their best performing metapath. Since a metapath's performance is limited by its least informative metaedge, the best performing metapath for a metaedge provides a lower bound on the pharmacologic utility of a given domain of information. B) Barplot of the model coefficients. Features were standardized prior to model fitting to make the coefficients comparable . Overall, 709 of the 1,206 metapaths exhibited a statistically significant Δ AUROC at a false discovery rate cutoff of 5%. These 709 metapaths included all 24 metaedges, suggesting that each type of relationship we integrated provided at least some therapeutic utility. However, not all metaedges were equally present in significant metapaths: 259 significant metapaths included a Compound–binds–Gene metaedge, whereas only 4 included a Gene–participates–Cellular Component metaedge. Table 3 lists the predictiveness of several metapaths of interest. Refer to the Discussion for our interpretation of these findings. A small selection of interesting or influential metapaths is provided (complete table online). Len. refers to number of metaedges composing the metapath. 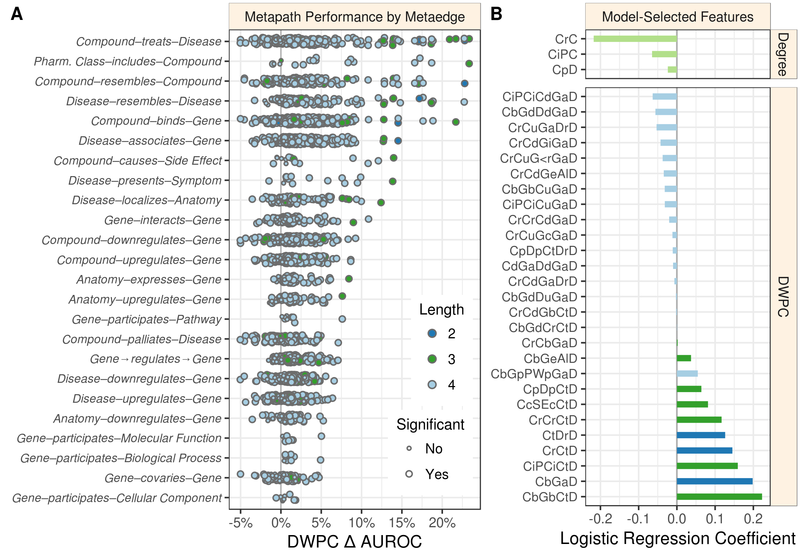 Δ AUROC and −log10(p) assess the performance of a metapath's DWPC in discriminating treatments from non-treatments (in the all-features stage as described in Methods). p assesses whether permutation affected AUROC. For reference, p = 0.05 corresponds to −log10(p) = 1.30. Note that several metapaths shown here provided little evidence that Δ AUROC ≠ 0 underscoring their poor ability to predict whether a compound treated a disease. Coef. reports a metapath's logistic regression coefficient as seen in Figure 2B. Metapaths removed in feature selection have missing coefficients whereas metapaths given zero-weight by the elastic net have coef. = 0.0. We implemented a machine learning approach to translate the network connectivity between a compound and a disease into a probability of treatment [40, 41]. The approach relies on the 755 known treatments as positives and 29,044 non-treatments as negatives to train a logistic regression model. Note that 179,369 non-treatments were omitted as negative training observations because they had a prior probability of treatment equal to zero (see Methods). The features consisted of a prior probability of treatment, node degrees for 14 metaedges, and DWPCs for 123 metapaths that were well suited for modeling. A cross-validated elastic net was used to minimize overfitting, yielding a model with 31 features (Figure 2B). The DWPC features with negative coefficients appear to be included as node-degree-capturing covariates, i.e. they reflect the general connectivity of the compound and disease rather than specific paths between them. However, the 11 DWPC features with non-negligible positive coefficients represent the most salient types of connectivity for systematically modeling drug efficacy. See the metapaths with positive coefficients in Table 3 for unabbreviated names. As an example, the CcSEcCtD feature assesses whether the compound causes the same side effects as compounds that treat the disease. Alternatively, the CbGeAlD feature assesses whether the compound binds to genes that are expressed in the anatomies affected by the disease. We applied this model to predict the probability of treatment between each of 1,538 connected compounds and each of 136 connected diseases, resulting in predictions for 209,168 compound–disease pairs , available at http://het.io/repurpose/. The 755 known disease-modifying indications were highly ranked (AUROC = 97.4%, Figure 3). The predictions also successfully prioritized two external validation sets: novel indications from DrugCentral (AUROC = 85.5%) and novel indications in clinical trial (AUROC = 70.0%). Together, these findings indicate that Project Rephetio has the ability to recognize efficacious compound–disease pairs. We assess how well our predictions prioritize four sets of indications. A) The y-axis labels denote the number of indications (+) and non-indications (−) composing each set. Violin plots with quartile lines show the distribution of indications when compound–disease pairs are ordered by their prediction. In all four cases, the actual indications were ranked highly by our predictions. B) ROC Curves with AUROCs in the legend. C) Precision–Recall Curves with AUPRCs in the legend. Predictions were scaled to the overall prevalence of treatments (0.36%). Hence a compound–disease pair that received a prediction of 1% represents a 2-fold enrichment over the null probability. 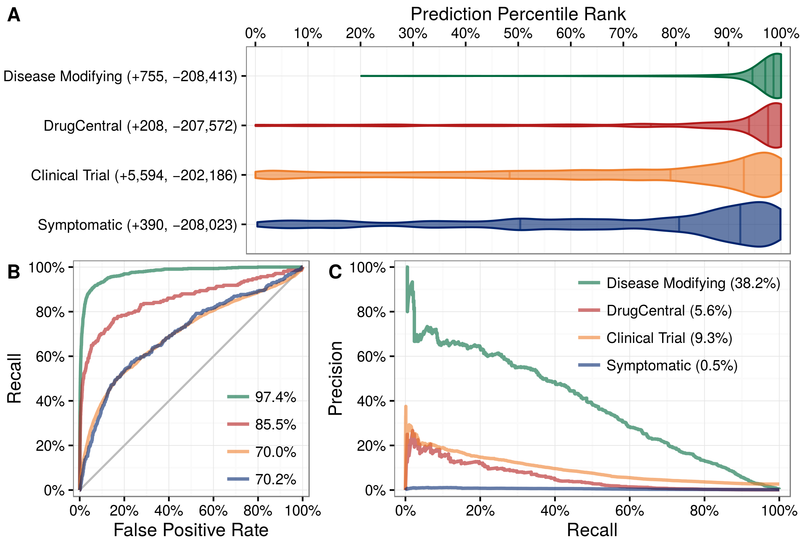 Of the 3,980 predictions with a probability exceeding 1%, 586 corresponded to known disease-modifying indications, leaving 3,394 repurposing candidates. For a given compound or disease, we provide the percentile rank of each prediction. Therefore, users can assess whether a given prediction is a top prediction for the compound or disease. In addition, our table-based prediction browser links to a custom guide for each prediction, which displays in the Neo4j Hetionet Browser. Each guide includes a query to display the top paths supporting the prediction and lists clinical trials investigating the indication. There are currently two FDA-approved medications for smoking cessation (varenicline and bupropion) that are not nicotine replacement therapies. PharmacotherapyDB v1.0 lists varenicline as a disease-modifying indication and nicotine itself as a symptomatic indication for nicotine dependence, but is missing bupropion. Bupropion was first approved for depression in 1985. Owing to the serendipitous observation that it decreased smoking in depressed patients taking this drug, Bupropion was approved for smoking cessation in 1997 . Therefore we looked whether Project Rephetio could have predicted this repurposing. Bupropion was the 9th best prediction for nicotine dependence (99.5th percentile) with a probability 2.50-fold greater than the null. Figure 4 shows the top paths supporting the repurposing of bupropion. This figure shows the 10 most supportive paths (out of 365 total) for treating nicotine dependence with bupropion, as available in this prediction's Neo4j Browser guide. Our method detected that bupropion targets the CHRNA3 gene, which is also targeted by the known-treatment varenicline . 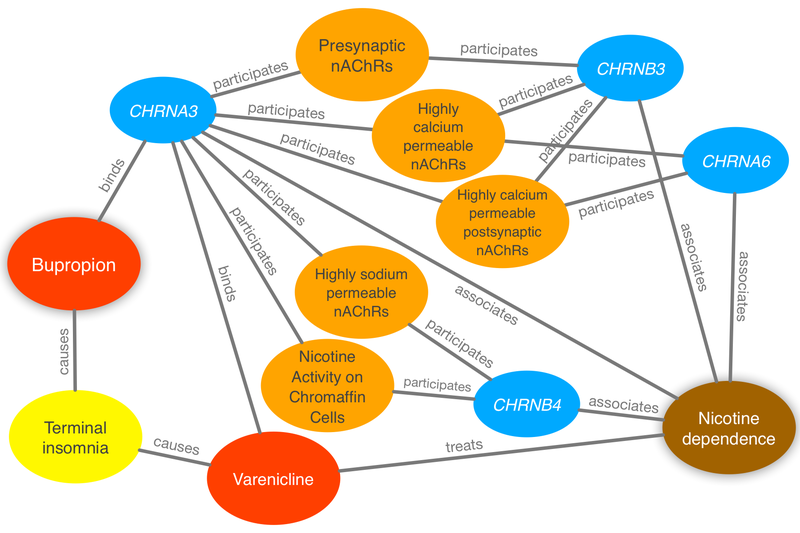 Furthermore, CHRNA3 is associated with nicotine dependence  and participates in several pathways that contain other nicotinic-acetylcholine-receptor (nAChR) genes associated with nicotine dependence. Finally, bupropion causes terminal insomnia  as does varenicline , which could indicate an underlying common mechanism of action. Atop the nicotine dependence predictions were nicotine (10.97-fold over null), cytisine (10.58-fold), and galantamine (9.50-fold). Cytisine is widely used in Eastern Europe for smoking cessation due to its availability at a fraction of the cost of other pharmaceutical options . In the last half decade, large scale clinical trials have confirmed cytisine's efficacy [49, 50]. Galantamine, an approved Alzheimer's treatment, is currently in Phase 2 trial for smoking cessation and is showing promising results . In summary, nicotine dependence illustrates Project Rephetio's ability to predict efficacious treatments and prioritize historic and contemporary repurposing opportunities. Several factors make epilepsy an interesting disease for evaluating repurposing predictions . Antiepileptic drugs work by increasing the seizure threshold — the amount of electric stimulation that is required to induce seizure. The effect of a drug on the seizure threshold can be cheaply and reliably tested in rodent models. As a result, the viability of most approved drugs in treating epilepsy is known. We focused our evaluation on the top 100 scoring compounds — referred to as the epilepsy predictions in this section — after discarding a single combination drug. We classified each compound as anti-ictogenic (seizure suppressing), unknown (no established effect on the seizure threshold), or ictogenic (seizure generating) according to medical literature . Of the top 100 epilepsy predictions, 77 were anti-ictogenic, 8 were unknown, and 15 were ictogenic (Figure 5A). Notably, the predictions contained 23 of the 25 disease-modifying antiepileptics in PharamcotherapyDB v1.0. A) Compounds — ranked from 1 to 100 by their predicted probability of treating epilepsy — are colored by their effect on seizures . The highest predictions are almost exclusively anti-ictogenic. Further down the prediction list, the prevalence of drugs with an ictogenic (contraindication) or unknown (novel repurposing candidate) effect on epilepsy increases. All compounds shown received probabilities far exceeding the null probability of treatment (0.36%). 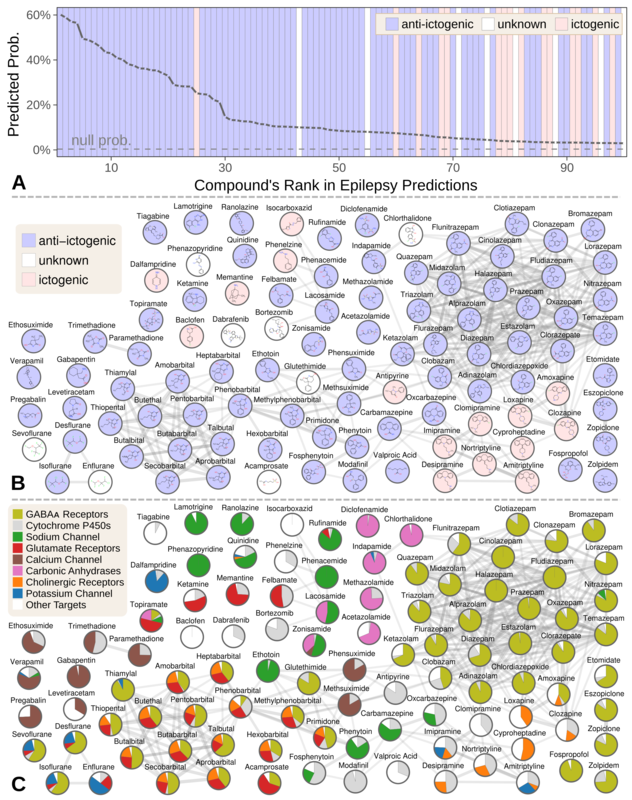 B) A chemical similarity network of the epilepsy predictions, with each compound's 2D structure . Edges are Compound–resembles–Compound relationships from Hetionet v1.0. Nodes are colored by their effect on seizures. C) The relative contribution of important drug targets to each epilepsy prediction . Specifically, pie charts show how the 8 most-supportive drug targets across all 100 epilepsy predictions contribute to individual predictions. Other Targets represents the aggregate contribution of all targets not listed. The network layout is identical to B. Many of the 77 anti-ictogenic compounds were not first-line antiepileptic drugs. Instead, they were used as ancillary drugs in the treatment of status epilepticus. For example, we predicted four halogenated ethers, two of which (isoflurane and desflurane) are used clinically to treat life-threatening seizures that persist despite treatment . As inhaled anesthetics, these compounds are not appropriate as daily epilepsy medications, but are feasible for refractory status epilepticus where patients are intubated. Given this high precision (77%), the 8 compounds of unknown effect are promising repurposing candidates. For example, acamprosate — whose top prediction was epilepsy — is a taurine analog that promotes alcohol abstinence. Support for this repurposing arose from acamprosate's inhibition of the glutamate receptor and positive modulation of the GABAᴀ receptor (Figure 5C). If effective against epilepsy, acamprosate could serve a dual benefit for recovering alcoholics who experience seizures from alcohol withdrawal. While certain classes of compounds were highly represented in our epilepsy predictions, such benzodiazepines and barbiturates, there was also considerable diversity . The 100 predicted compounds encompassed 26 third-level ATC codes , such as antiarrhythmics (quinidine, classified as anti-ictogenic) and urologicals (phenazopyridine, classified as unknown). Furthermore, 25 of the compounds were chemically distinct, i.e. they did not resemble any of the other epilepsy predictions (Figure 5B). Next, we investigated which components of Hetionet contributed to the epilepsy predictions . In total, 392,956 paths of 12 types supported the predictions. Using several different methods for grouping paths, we were able to quantify the aggregate biological evidence. Our algorithm primarily drew on two aspects of epilepsy: its known treatments (76% of the total support) and its genetic associations (22% of support). In contrast, our algorithm drew heavily on several aspects of the predicted compounds: their targeted genes (44%), their chemically similar compounds (30%), their pharmacologic classes, their palliative indications (5%), and their side effects (4%). Specifically, 266,192 supporting paths originated with a Compound–binds–Gene relationship. Aggregating support by these genes shows the extent that 121 different drug targets contributed to the predictions . In order of importance, the predictions targeted GABAᴀ receptors (15.3% of total support), cytochrome P450 enzymes (5.6%), the sodium channel (4.6%), glutamate receptors (3.8%), the calcium channel (2.7%), carbonic anhydrases (2.5%), cholinergic receptors (2.1%) and the potassium channel (1.4%). Besides cytochrome P450, which primarily influences pharmacokinetics , our method detected and leveraged bonafide anti-ictogenic mechanisms . Figure 5C shows drug target contributions per compound and illustrates the considerable mechanistic diversity among the predictions. Also notable are the 15 ictogenic compounds in our top 100 predictions. Nine of the ictogenic compounds share a tricyclic structure (Figure 5B), five of which are tricyclic antidepressants. While the ictogenic mechanisms of these antidepressants are still unclear , Figure 5C suggests their anticholinergic effects may be responsible , in accordance with previous theories . We also ranked the contribution of the 1,137 side effects that supported the epilepsy predictions through 117,720 CcSEcCtD paths. The top five side effects — ataxia (0.069% of total support), nystagmus (0.049%), diplopia (0.045%), somnolence (0.044%), and vomiting (0.043%) — reflect established adverse effects of antiepileptic drugs [61, 62, 63, 64, 65]. In summary, our method simultaneously identified the hallmark side effects of antiepileptic drugs while incorporating this knowledge to prioritize 1,538 compounds for anti-ictogenic activity. We created Hetionet v1.0 by integrating 29 resources into a single data structure — the hetnet. Consisting of 11 types of nodes and 24 types of relationships, Hetionet v1.0 brings more types of information together than previous leading-studies in biological data integration . Moreover, we strove to create a reusable, extensible, and property-rich network. While all of the resources we include are publicly available, their integration was a time-intensive undertaking. Hetionet allows researchers to begin answering integrative questions without having to first spend months processing data. Our public Neo4j instance allows users to immediately interact with Hetionet. Through the Cypher language, users can perform highly specialized graph queries with only a few lines of code. Queries can be executed in the web browser or programmatically from a language with a Neo4j driver. For users that are unfamiliar with Cypher, we include several example queries in a Browser guide. In contrast to traditional REST APIs, our public Neo4j instance provides users with maximal flexibility to construct custom queries by exposing the underlying database. As data has grown more plentiful and diverse, so has the applicability of hetnets. Unfortunately, network science has been naturally fragmented by discipline resulting in relatively slow progress in integrating heterogeneous data. A 2014 analysis identified 78 studies using multilayer networks — a superset of hetnets (heterogeneous information networks) with the potential for additional dimensions, such as time. However, the studies relied on 26 different terms, 9 of which had multiple definitions [67, 68]. Nonetheless, core infrastructure and algorithms for hetnets are emerging. Compared to the existing mathematical frameworks for multilayer networks that must deal with layers other than type (such as the aspect of time) , the primary obligation of hetnet algorithms is to be type aware. One goal of our project has been to unite hetnet research across disciplines. We approached this goal by making Project Rephetio entirely available online and inviting community feedback throughout the process . Integrating every resource into a single interconnected data structure allowed us to assess systematic mechanisms of drug efficacy. Using the max performing metapath to assess the pharmacological utility of a metaedge (Figure 2A), we can divide our relationships into tiers of informativeness. The top tier consists of the types of information traditionally considered by pharmacology: Compound–treats–Disease, Pharmacologic Class–includes–Compound, Compound–resembles–Compound, Disease–resembles–Disease, and Compound–binds–Gene. The upper-middle tier consists of types of information that have been the focus of substantial medical study, but have only recently started to play a bigger role in drug development, namely the metaedges Disease–associates–Gene, Compound–causes–Side Effect, Disease–presents–Symptom, Disease–localizes–Anatomy, and Gene–interacts–Gene. The lower-middle tier contains the transcriptomics metaedges such as Compound–downregulates–Gene, Anatomy–expresses–Gene, Gene→regulates→Gene, and Disease–downregulates–Gene. Much excitement surrounds these resources due to their high throughput and genome-wide scope, which offers a route to drug discovery that is less biased by existing knowledge. However, our findings suggest that these resources are only moderately informative of drug efficacy. Other lower-middle tier metaedges were the product of time-intensive biological experimentation, such as Gene–participates–Pathway, Gene–participates–Molecular Function, and Gene–participates–Biological Process. Unlike the top tier resources, this knowledge has historically been pursued for basic science rather than primarily medical applications. The weak yet appreciable performance of the Gene–covaries–Gene suggests the synergy between the fields of evolutionary genomics and disease biology. The lower tier included the Gene–participates–Cellular Component metaedge, which may reflect that the relevance of cellular location to pharmacology is highly case dependent and not amenable to systematic profiling. The performance of specific metapaths (Table 3) provides further insight. For example, significant emphasis has been put on the use of transcriptional data for drug repurposing . One common approach has been to identify compounds with opposing transcriptional signatures to a disease [70, 18]. However, several systematic studies report underwhelming performance of this approach [25, 24, 26] — a finding supported by the low performance of the CuGdD and CdGuD metapaths in Project Rephetio. Nonetheless, other transcription-based methods showed some promise. Compounds with similar transcriptional signatures were prone to treating the same disease (CuGuCtD and CdGdCtD metapaths), while compounds with opposing transcriptional signatures were slightly averse to treating the same disease (CuGdCtD and CdGuCtD metapaths). In contrast, diseases with similar transcriptional profiles were not prone to treatment by the same compound (CtDdGuD and CtDuGdD). By comparably assessing the informativeness of different metaedges and metapaths, Project Rephetio aims to guide future research towards promising data types and analyses. One caveat is that omics-scale experimental data will likely play a larger role in developing the next generation of pharmacotherapies. Hence, were performance reevaluated on treatments discovered in the forthcoming decades, the predictive ability of these data types may rise. Encouragingly, most data types were at least weakly informative and hence suitable for further study. Ideally, different data types would provide orthogonal information. However, our model for whether a compound treats a disease focused on 11 metapaths — a small portion of the hundreds of metapaths available. While parsimony aids interpretation, our model did not draw on the weakly-predictive high-throughput data types — which are intriguing for their novelty, scalability, and cost-effectiveness — as much as we had hypothesized. Instead our model selected types of information traditionally considered in pharmacology. However unlike a pharmacologist whose area of expertise may be limited to a few drug classes, our model was able to predict probabilities of treatment for all 209,168 compound–disease pairs. Furthermore, our model systematically learned the importance of each type of network connectivity. For any compound–disease pair, we now can immediately provide the top network paths supporting its therapeutic efficacy. A traditional pharmacologist may be able to produce a similar explanation, but likely not until spending substantial time researching the compound's pharmacology, the disease's pathophysiology, and the molecular relationships in between. Accordingly, we hope certain predictions will spur further research, such as trials to investigate the off-label use of acamprosate for epilepsy, which is supported by one animal model . As demonstrated by the 15 ictogenic compounds in our top 100 epilepsy predictions, Project Rephetio's predictions can include contraindications in addition to indications. Since many of Hetionet v1.0's relationship types are general (e.g. the Compound–binds–Gene relationship type conflates antagonist with agonist effects), we expect some high scoring predictions to exacerbate rather than treat the disease. However, the predictions made by Hetionet v1.0 represent such substantial relative enrichment over the null that uncovering the correct directionality is a logical next step and worth undertaking. Going forward, advances in automated mining of the scientific literature could enable extraction of precise relationship types at omics scale [72, 73]. Future research should focus on gleaning orthogonal information from data types that are so expansive that computational methods are the only option. Our CuGuCtD feature — measuring whether a compound upregulates the same genes as compounds which treat the disease — is a good example. This metapath was informative by itself (Δ AUROC = 4.4%) but was not selected by the model, despite its orthogonal origin (gene expression) to selected metapaths. Using a more extensive catalog of treatments as the gold standard would be one possible approach to increase the power of feature selection. Integrating more types of information into Hetionet should also be a future priority. The "network effect" phenomenon suggests that the addition of each new piece of information will enhance the value of Hetionet's existing information. We envision a future where all biological knowledge is encoded into a single hetnet. Hetionet v1.0 was an early attempt, and we hope the strong performance of Project Rephetio in repurposing drugs foreshadows the many applications that will thrive from encoding biology in hetnets. Hetionet was built entirely from publicly available resources with the goal of integrating a broad diversity of information types of medical relevance, ranging in scale from molecular to organismal. Practical considerations such as data availability, licensing, reusability, documentation, throughput, and standardization informed our choice of resources. We abided by a simple litmus test for determining how to encode information in a hetnet: nodes represent nouns, relationships represent verbs [74, 75]. Our method for relationship prediction creates a strong incentive to avoid redundancy, which increases the computational burden without improving performance. In a previous study to predict disease–gene associations using a hetnet of pathophysiology , we found that different types of gene sets contributed highly redundant information. Therefore, in Hetionet v1.0 we reduced the number of gene set node types from 14 to 3 by omitting several gene set collections and aggregating all pathway nodes. Nodes encode entities. We extracted nodes from standard terminologies, which provide curated vocabularies to enable data integration and prevent concept duplication. The ease of mapping external vocabularies, adoption, and comprehensiveness were primary selection criteria. Hetionet v1.0 includes nodes from 5 ontologies — which provide hierarchy of entities for a specific domain — selected for their conformity to current best practices . We selected 137 terms from the Disease Ontology [77, 78] (which we refer to as DO Slim [79, 80]) as our disease set. Our goal was to identify complex diseases that are distinct and specific enough to be clinically relevant yet general enough to be well annotated. To this end, we included diseases that have been studied by GWAS and cancer types from TopNodes_DOcancerslim . We ensured that no DO Slim disease was a subtype of another DO Slim disease. Symptoms were extracted from MeSH by taking the 438 descendants of Signs and Symptoms [82, 83]. Approved small molecule compounds with documented chemical structures were extracted from DrugBank version 4.2 [84, 85, 86]. Unapproved compounds were excluded because our focus was repurposing. In addition, unapproved compounds tend to be less studied than approved compounds making them less attractive for our approach where robust network connectivity is critical. Finally, restricting to small molecules with known documented structures enabled us to map between compound vocabularies (see Mappings). Side effects were extracted from SIDER version 4.1 [87, 88, 89]. SIDER codes side effects using UMLS identifiers , which we also adopted. Pharmacologic Classes were extracted from the DrugCentral data repository [91, 92]. Only pharmacologic classes corresponding to the "Chemical/Ingredient", "Mechanism of Action", and "Physiologic Effect" FDA class types were included to avoid pharmacologic classes that were synonymous with indications . Protein-coding human genes were extracted from Entrez Gene [93, 94, 95]. Anatomical structures, which we refer to as anatomies, were extracted from Uberon . We selected a subset of 402 Uberon terms by excluding terms known not to exist in humans and terms that were overly broad or arcane [97, 98]. Pathways were extracted by combining human pathways from WikiPathways [99, 100], Reactome , and the Pathway Interaction Database . The latter two resources were retrieved from Pathway Commons , which compiles pathways from several providers. Duplicate pathways and pathways without multiple participating genes were removed [104, 105]. Biological processes, cellular components, and molecular functions were extracted from the Gene Ontology . Only terms with 2–1000 annotated genes were included. Before adding relationships, all identifiers needed to be converted into the vocabularies matching that of our nodes. Oftentimes, our node vocabularies included external mappings. For example, the Disease Ontology includes mappings to MeSH, UMLS, and the ICD, several of which we submitted during the course of this study . In a few cases, the only option was to map using gene symbols, a disfavored method given that it can lead to ambiguities. When mapping external disease concepts onto DO Slim, we used transitive closure. For example, the UMLS concept for primary progressive multiple sclerosis (C0751964) was mapped to the DO Slim term for multiple sclerosis (DOID:2377). Chemical vocabularies presented the greatest mapping challenge , since these are poorly standardized . UniChem's  Connectivity Search  was used to map compounds, which maps by atomic connectivity (based on First InChIKey Hash Blocks ) and ignores small molecular differences. Anatomy–downregulates–Gene and Anatomy–upregulates–Gene edges [112, 113, 114] were extracted from Bgee , which computes differentially expressed genes by anatomy in post-juvenile adult humans. Anatomy–expresses–Gene edges were extracted from Bgee and TISSUES [116, 117, 118]. Compound–binds–Gene edges were aggregated from BindingDB [119, 120], DrugBank [121, 84], and DrugCentral . Only binding relationships to single proteins with affinities of at least 1 μM (as determined by Kd, Kᵢ, or IC₅₀) were selected from the October 2015 release of BindingDB [122, 123]. Target, carrier, transporter, and enzyme interactions with single proteins (i.e. excluding protein groups) were extracted from DrugBank 4.2 [124, 86]. In addition, all mapping DrugCentral target relationships were included . Compound–treats–Disease (disease-modifying indications) and Compound–palliates–Disease (symptomatic indications) edges are from PharmacotherapyDB as described in Intermediate resources. Compound–causes–Side Effect edges were obtained from SIDER 4.1 [87, 88, 89], which uses natural language processing to identify side effects in drug labels. Compound–resembles–Compound relationships [125, 86, 126] represent chemical similarity and correspond to a Dice coefficient ≥ 0.5  between extended connectivity fingerprints [128, 129]. Pharmacologic Class–includes–Compound edges were extracted from DrugCentral for three FDA class types [91, 92]. Compound–downregulates–Gene and Compound–upregulates–Gene relationships were computed from LINCS L1000 as described in Intermediate resources. Disease–associates–Gene edges were extracted from the GWAS Catalog , DISEASES [131, 132], DisGeNET [133, 134], and DOAF [135, 136]. The GWAS Catalog compiles disease–SNP associations from published GWAS . We aggregated overlapping loci associated with each disease and identified the mode reported gene for each high confidence locus [138, 139]. DISEASES integrates evidence of association from text mining, curated catalogs, and experimental data . Associations from DISEASES with integrated scores ≥ 2 were included after removing the contribution of DistiLD. DisGeNET integrates evidence from over 10 sources and reports a single score for each association [141, 142]. Associations with scores ≥ 0.06 were included. DOAF mines Entrez Gene GeneRIFs (textual annotations of gene function) for disease mentions . Associations with 3 or more supporting GeneRIFs were included. Disease–downregulates–Gene and Disease–upregulates–Gene relationships [144, 145] were computed using STARGEO as described in Intermediate resources. Disease–localizes–Anatomy, Disease–presents–Symptom, and Disease–resembles–Disease edges were calculated from MEDLINE co-occurrence [82, 146]. MEDLINE is a subset of 21 million PubMed articles for which designated human curators have assigned topics. When retrieving articles for a given topic (MeSH term), we activated two non-default search options as specified below: majr for selecting only articles where the topic is major and noexp for suppressing explosion (returning articles linked to MeSH subterms). We identified 4,161,769 articles with two or more disease topics; 696,252 articles with both a disease topic (majr) and an anatomy topic (noexp) ; and 363,928 articles with both a disease topic (majr) and a symptom topic (noexp). We used a Fisher's exact test  to identify pairs of terms that occurred together more than would be expected by chance in their respective corpus. We included co-occurring terms with p < 0.005 in Hetionet v1.0. Gene→regulates→Gene directed edges were generated from the LINCS L1000 genetic interference screens (see Intermediate resources) and indicate that knockdown or overexpression of the source gene significantly dysregulated the target gene [149, 150]. Gene–covaries–Gene edges represent evolutionary rate covariation ≥ 0.75 [151, 152, 153]. Gene–interacts–Gene edges [154, 155] represent when two genes produce physically-interacting proteins. We compiled these interactions from the Human Interactome Database [156, 157, 158, 159], the Incomplete Interactome , and our previous study . Gene–participates–Biological Process, Gene–participates–Cellular Component, and Gene–participates–Molecular Function edges are from Gene Ontology annotations . As described in Intermediate resources, annotations were propagated [162, 163]. Gene–participates–Pathway edges were included from the human pathway resources described in the Nodes section [104, 105]. Whether a certain type of relationship has directionality is defined at the metaedge level. Directed metaedges are only necessary when they connect a metanode to itself and correspond to an asymmetric relationship. In the case of Hetionet v1.0, the sole directed metaedge was Gene→regulates→Gene. To demonstrate the implications of directionality, Hetionet v1.0 contains two relationships between the genes HADH and STAT1: HADH–interacts–STAT1 and HADH→regulates→STAT1. Both edges can be represented in the inverse orientation: STAT1–interacts–HADH and STAT1←regulates←HADH. However due to directed nature of the regulates relationship, STAT1→regulates→HADH is a distinct edge, which does not exist in the network. Similarly, HADH–associates–obesity and obesity–associates–HADH are inverse orientations of the same underlying undirected relationship. Accordingly, the following path exists in the network: obesity–associates–HADH→regulates→STAT1, which can also be inverted to STAT1←regulates←HADH–associates–obesity. In the process of creating Hetionet, we produced several datasets with broad applicability that extended beyond Project Rephetio. These resources are referred to as intermediate resources and described below. STARGEO is a nascent platform for annotating and meta-analyzing differential gene expression experiments. The STAR acronym stands for Search-Tag-Analyze Resources, while GEO refers to the Gene Expression Omnibus [164, 165]. STARGEO is a layer on top of GEO that crowdsources sample annotation and automates meta-analysis. Using STARGEO, we computed differentially expressed genes between healthy and diseased samples for 49 diseases [144, 145]. First, we and others created case/control tags for 66 diseases. After combing through GEO series and tagging samples, 49 diseases had sufficient data for case-control meta-analysis: multiple series with at least 3 cases and 3 controls. For each disease, we performed a random effects meta-analysis on each gene to combine log2 fold-change across series. These analyses incorporated 27,019 unique samples from 460 series on 107 platforms. Differentially expressed genes (false discovery rate ≤ 0.05) were identified for each disease. The median number of upregulated genes per disease was 351 and the median number of downregulated genes was 340. Endogenous depression was the only of the 49 diseases without any significantly dysregulated genes. LINCS L1000 profiled the transcriptional response to small molecule and genetic interference perturbations. To increase throughput, expression was only measured for 978 genes, which were selected for their ability to impute expression of the remaining genes. A single perturbation was often assayed under a variety of conditions including cell types, dosages, timepoints, and concentrations. Each condition generates a single signature of dysregulation z-scores. We further processed these signatures to fit into our approach [166, 167]. First we computed consensus signatures — which meta-analyze multiple signatures to condense them into one — for DrugBank small molecules, Entrez genes, and all L1000 perturbations [149, 150]. First, we discarded non-gold (non-replicating or indistinct) signatures. Then we meta-analyzed z-scores using Stouffer's method. Each signature was weighted by its average Spearman's correlation to other signatures, with a 0.05 minimum, to de-emphasize discordant signatures. Our signatures include the 978 measured genes and the 6,489 imputed genes from the "best inferred gene subset". To identify significantly dysregulated genes, we selected genes using a Bonferroni cutoff of p = 0.05 and limited the number of imputed genes to 1,000. The consensus signatures for genetic perturbations allowed us to assess various characteristics of the L1000 dataset. First, we looked at whether genetic interference dysregulated its target gene in the expected direction . Looking at measured z-scores for target genes, we found that the knockdown perturbations were highly reliable, while the overexpression perturbations were only moderately reliable with 36% of overexpression perturbations downregulating their target. However, imputed z-scores for target genes barely exceeded chance at responding in the expected direction to interference. Hence, we concluded that the imputation quality of LINCS L1000 is poor. However, when restricting to significantly dyseregulated targets, 22 out of 29 imputed genes responded in the expected direction. This provides some evidence that the directional fidelity of imputation is higher for significantly dysregulated genes. Finally, we found that the transcriptional signatures of knocking down and overexpressing the same gene were positively correlated 65% of the time, suggesting the presence of a general stress response . Based on these findings, we performed additional filtering of signifcantly dysregulated genes when building Hetionet v1.0. Compound–down/up-regulates–Gene relationships were restricted to the 125 most significant per compound-direction-status combination (status refers to measured versus imputed). For genetic interference perturbations, we restricted to the 50 most significant genes per gene-direction-status combination and merged the remaining edges into a single Gene→regulates→Gene relationship type containing both knockdown and overexpression perturbations. We created PharmacotherapyDB, an open catalog of drug therapies for disease [170, 171, 172]. Version 1.0 contains 755 disease-modifying therapies and 390 symptomatic therapies between 97 diseases and 601 compounds. This resource was motivated by the need for a gold standard of medical indications to train and evaluate our approach. Initially, we identified four existing indication catalogs : MEDI-HPS which mined indications from RxNorm, SIDER 2, MedlinePlus, and Wikipedia ; LabeledIn which extracted indications from drug labels via human curation [175, 176, 177]; EHRLink which identified medication–problem pairs that clinicians linked together in electronic health records [178, 179]; and indications from PREDICT, which were compiled from UMLS relationships, drugs.com, and drug labels . After mapping to DO Slim and DrugBank Slim, the four resources contained 1,388 distinct indications. However, we noticed that many indications were palliative and hence problematic as a gold standard of pharmacotherapy for our in silico approach. Therefore, we recruited two practicing physicians to curate the 1,388 preliminary indications . After a pilot on 50 indications, we defined three classifications: disease modifying meaning a drug that therapeutically changes the underlying or downstream biology of the disease; symptomatic meaning a drug that treats a significant symptom of the disease; and non-indication meaning a drug that neither therapeutically changes the underlying or downstream biology nor treats a significant symptom of the disease. Both curators independently classified all 1,388 indications. The two curators disagreed on 444 calls (Cohen's κ = 49.9%). We then recruited a third practicing physician, who reviewed all 1,388 calls and created a detailed explanation of his methodology . We proceeded with the third curator's calls as the consensus curation. The first two curators did have reservations with classifying steroids as disease modifying for autoimmune diseases. We ultimately considered that these indications met our definition of disease modifying, which is based on a pathophysiological rather than clinical standard. Accordingly, therapies we consider disease modifying may not be used to alter long-term disease course in the modern clinic due to a poor risk–benefit ratio. We created a browser (http://git.dhimmel.com/gene-ontology/) to provide straightforward access to Gene Ontology annotations [163, 162]. Our service provides annotations between Gene Ontology terms and Entrez Genes. The user chooses propagated/direct annotation and all/experimental evidence. Annotations are currently available for 37 species and downloadable as user-friendly TSV files. We committed to openly releasing our data and analyses from the origin of the project . Our goals were to contribute to the advancement of science [182, 183], maximize our impact [184, 185], and enable reproducibility [186, 187, 188]. These objectives required publicly distributing and openly licensing Hetionet and Project Rephetio data and analyses [189, 190]. Hetionet v1.0 integrates 29 resources, but two resources were removed prior to the v1.0 release. Of the total 31 resources , five were United States government works not subject to copyright, and twelve had licenses that met the Open Definition of knowledge version 2.1. Four resources allowed only non-commercial reuse. Most problematic were the remaining nine resources that had no license — which equates to all rights reserved by default and forbids reuse  — and one resource that explicitly forbid redistribution. Additional difficulty resulted from license incompatibles across resources, which was caused primarily by non-commercial and share-alike stipulations. Furthermore, it was often unclear who owned the data . Therefore, we sought input from legal experts and chronicled our progress [192, 195, 196, 197, 198]. Ultimately, we did not find an ideal solution. We had to choose between absolute compliance and Hetionet: strictly adhering to copyright and licensing arrangements would have decimated the network. On the other hand, in the United States, mere facts are not subject to copyright, and fair use doctrine helps protect reuse that is transformative and educational. Hence, we choose a path forward which balanced legal, normative, ethical, and scientific considerations. If a resource was in the public domain, we licensed any derivatives as CC0 1.0. For resources licensed to allow reuse, redistribution, and modification, we transmitted their licenses as properties on the specific nodes and relationships in Hetionet v1.0. For all other resources — for example, resources without licenses or with licenses that forbid redistribution — we sent permission requests to their creators. The median time till first response to our permission requests was 16 days, with only 2 resources affirmatively granting us permission. We did not receive any responses asking us to remove a resource. However, we did voluntarily remove MSigDB , since its license was highly problematic . As a result of our experience, we recommend that publicly-funded data should be explicitly dedicated to the public domain whenever possible. From Hetionet, we derived five permuted hetnets . The permutations preserve node degree but eliminate edge specificity by employing an algorithm called XSwap to randomly swap edges . To extend XSwap to hetnets , we permuted each metaedge separately, so that edges were only swapped with other edges of the same type. We adopted a Markov chain approach, whereby the first permuted hetnet was generated from Hetionet v1.0, the second permuted hetnet was generated from the first, and so on. For each metaedge, we assessed the percent of edges unchanged as the algorithm progressed to ensure that a sufficient number of swaps had been performed to randomize the network . Permuted hetnets are useful for computing the baseline performance of meaningless edges while preserving node degree . Since, our use of permutation focused on assessing Δ AUROC, a small number of permuted hetnets was sufficient, as the variability in a metapath's AUROC across the permuted hetnets was low. Traditional relational databases — such as SQLite, MySQL, and PostgreSQL — excel at storing highly structured data in tables. Connectivity between tables is accomplished using foreign-key references between columns. However, for many biomedical applications the connectivity between entities is of foremost importance. Furthermore, enforcing a rigid structure of what attributes an entity may possess is less important and often unnecessarily prohibitive. Graph databases focus instead on capturing connectivity (relationships) between entities (nodes). Accordingly, graph databases such as Neo4j offer greater ease when modeling biomedical relationships and superior performance when traversing many levels of connectivity [203, 204]. Until recently, graph database adoption in bioinformatics was limited . However lately, the demand to model and capture biological connectivity at scale has led to increasing adoption [206, 207, 208, 209]. We used the Neo4j graph database for storing and operating on Hetionet and noticed major benefits from tapping into this large open source ecosystem . Persistent storage with immediate access and the Cypher query language — a sort of SQL for hetnets — were two of the biggest benefits. To facilitate our migration to Neo4j, we updated hetio — our existing Python package for hetnets  — to export networks into Neo4j and DWPC queries to Cypher. In addition, we created an interactive GraphGist for Project Rephetio, which introduces our approach and showcases its Cypher queries. Finally, we created a public Neo4j instance , which leverages several modern technologies such Neo4j Browser guides, cloud hosting with HTTPS, and Docker deployment [213, 214]. Project Rephetio relied on the previously-published DWPC metric to generate features for compound–disease pairs. The DWPC measures the prevalence of a given metapath between a given source and target node . It is calculated by first extracting all paths from the source to target node that follow the specified metapath. Next, each path is weighted by taking the product of the node degrees along the path raised to a negative exponent. This damping exponent — the sole parameter — thereby determines the extent that paths through high-degree nodes are downweighted: we chose w = 0.4 based on our past optimizations . The DWPC equals the sum of the path weights (referred to as path-degree products). Traversing the hetnet to extract all paths between a source and target node, which we performed in Neo4j, is the most computationally intensive step in computing DWPCs . For future work, we are exploring matrix multiplication approaches, which could improve runtime several orders of magnitude. Project Rephetio made several refinements to metapath-based hetnet edge prediction compared to previous studies [22, 23]. First, we transformed DWPCs by mean scaling and then taking the inverse hyperbolic sine  to make them more amenable to modeling . Second, we bifurcated the workflow into an all-features stage and an all-observations stage . The all-features stage assesses feature performance and does not require computing features for all negatives. Here we selected a random subset of 3,020 (4 × 755) negatives. Little error was introduced by this optimization, since the predominant limitation to performance assessment was the small number of positives (755) rather than negatives. Based on the all-features performance assessment , we selected 142 DWPCs to compute on all observations (all 209,168 compound–disease pairs). The feature selection was designed to remove uninformative features (according to permutation) and guard against edge-dropout contamination . Third, we included 14 degree features, which assess the degree of a specific metaedge for either the source compound or target disease. To improve the interpretability of the predictions, we developed a method for decomposing a prediction into its network support . This information is deployed to our Neo4j Browser guides, allowing users to assess the biomedical evidence contributing to a given prediction. First, we used logistic regression terms to quantify the contribution of metapaths that positively support a prediction. Second, we decomposed a metapath's contribution, according to its DWPC, into specific paths contributions. Finally, we aggregated paths based on their source (first) or target (last) edge to quantify the contribution of specific edges of the source compound or target disease . Using the acamprosate–epilepsy prediction as an example, we first quantified metapath contributions: 40% of the prediction was supported by CbGbCtD paths, 36% by CbGaD paths, 11% by CcSEcCtD paths, 8% by CbGpPWpGaD paths, and 5% by CbGeAlD paths. Second, we calculated path contributions: Acamprosate–binds–GRM5–associates–epilepsy syndrome was the most supportive path, contributing 11% of the prediction. Finally, we aggregated path contributions to calculate that the source edge of Acamprosate—binds—GRM5 contributed 23% of the prediction, while the target edge of epilepsy syndrome–treats–Felbamate contributed 12%. The 755 treatments in Hetionet v1.0 are not evenly distributed between all compounds and diseases. For example, methotrexate treats 19 diseases and hypertension is treated by 68 compounds. We estimated a prior probability of treatment — based only on the treatment degree of the source compound and target disease — on 744,975 permutations of the bipartite treatment network . Methotrexate received a 79.6% prior probability of treating hypertension, whereas a compound and disease that both had only one treatment received a prior of 0.12%. Across the 209,168 compound–disease pairs, the prior predicted the known treatments with AUROC = 97.9%. The strength of this association threatened to dominate our predictions. However, not modeling the prior can lead to omitted-variable bias and confounded proxy variables. To address the issue, we included the logit-transformed prior, without any regularization, as a term in the model. This restricted model fitting to the 29,799 observations with a nonzero prior — corresponding to the 387 compounds and 77 diseases with at least one treatment. To enable predictions for all 209,168 observations, we set the prior for each compound–disease pair to the overall prevalence of positives (0.36%). This method succeeded at accommodating the treatment degrees. The prior probabilities performed poorly on the validation sets with AUROC = 54.1% on DrugCentral indications and AUROC = 62.5% on clinical trials. This performance dropoff compared to training shows the danger of encoding treatment degree into predictions. The benefits of our solution are highlighted by the superior validation performance of our predictions compared to the prior (Figure 3). We evaluated our predictions on four sets of indications as shown in Figure 3. Disease Modifying — the 755 disease modifying treatments in PharmacotherapyDB v1.0. These indications are included in the hetnet as treats edges and used to train the logistic regression model. Due to edge dropout contamination and self-testing [219, 223], overfitting could potentially inflate performance on this set. Therefore, for the three remaining indication sets, we removed any observations that were positives in this set. DrugCentral — We discovered the DrugCentral database after completing our physician curation for PharmacotherapyDB. This database contained 210 additional indications . While we didn't curate these indications, we observed a high proportion of disease modifying therapy. Clinical Trial — We compiled indications that have been investigated by clinical trial from ClinicalTrials.gov . This set contains 5,594 indications. Since these indications were not manually curated and clinical trials often show a lack of efficacy, we expected lower performance on this set. Symptomatic — 390 symptomatic indications from PharacotherapyDB. These edges are included in the hetnet as palliates edges. Only the Clinical Trial and DrugCentral indication sets were used for external validation, since the Disease Modifying and Symptomatic indications were included in the hetnet. As an aside, several additional indication catalogs have recently been published, which future studies may want to also consider [173, 225, 226, 227]. We conducted our study using Thinklab — a platform for realtime open collaborative science — on which this study was the first project. We began the study by publicly proposing the idea and inviting discussion . We continued by chronicling our progress via discussions. We used Thinklab as the frontend to coordinate and report our analyses and GitHub as the backend to host our code, data, and notebooks. On top of our Thinklab team consisting of core contributors, we welcomed community contribution and review. In areas where our expertise was lacking or advice would be helpful, we sought input from domain experts and encouraged them to respond on Thinklab where their comments would be CC BY licensed and their contribution rated and rewarded. In total, 40 non-team members commented across 86 discussions, which generated 622 comments and 191 notes (Figure 6). Thinklab content for this project totaled 145,771 words or 918,837 characters . Using an estimated 7,000 words per academic publication as a benchmark, Project Rephetio generated written content comparable in volume to 20.8 publications prior to its completion. We noticed several other benefits from using Thinklab including forging a community of contributors ; receiving feedback during the early stages when feedback was most actionable ; disseminating our research without delay [232, 233]; opening avenues for external input ; facilitating problem-oriented teaching [235, 236]; and improving our documentation by maintaining a publication-grade digital lab notebook . 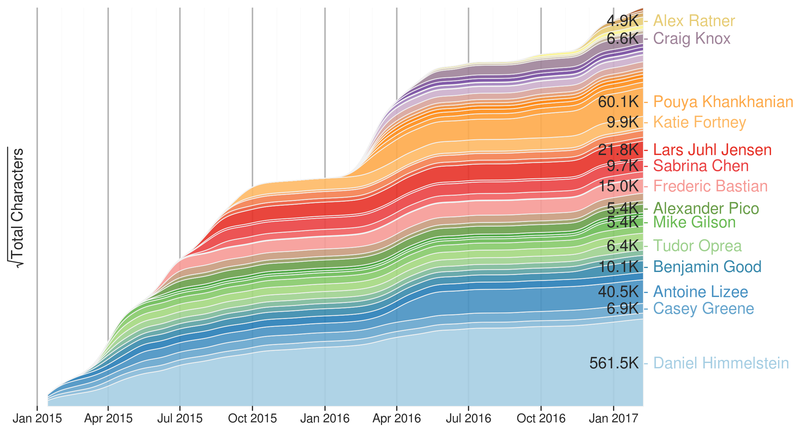 This figure shows Project Rephetio contributions by user over time. Each band represented the cumulative contribution of a Thinklab user to discussions in the Rephetio project . Users are ordered by date of first contribution. Users who contributed over 4,500 characters are named. The square root transformation of characters written per user accentuates the activity of new contributors, thereby emphasizing collaboration and diverse input. Thinklab began winding down operations in July 2017 and has switched to a static state. While users will no longer be able to add comments, the corpus of content remains browsable at https://think-lab.github.io and available in machine-readable formats at https://github.com/dhimmel/thinklytics. We are immensely grateful to our Thinklab contributors who joined us in our experiment of radically open science. The following non-team members provided contributions that received 5 or more Thinklab points: Lars Juhl Jensen, Frederic Bastian, Alexander Pico, Casey Greene, Benjamin Good, Craig Knox, Mike Gilson, Chris Mungall, Katie Fortney, Venkat Malladi, Tudor Oprea, MacKenzie Smith, Caty Chung, Allison McCoy, Alexey Strokach, Ritu Khare, Greg Way, Marina Sirota, Raghavendran Partha, Oleg Ursu, Jesse Spaulding, Gaya Nadarajan, Alex Ratner, Scooter Morris, Alessandro Didonna, Alex Pankov, Tong Shu Li, and Janet Piñero. Additionally, the founder of Thinklab, Jesse Spaulding, supported community contributions and developed the platform with Project Rephetio's needs in mind. We also appreciate DigitalOcean's sponsorship the Hetionet Browser to cover its hosting costs. Finally, we would like to thank Neo Technology, whose staff provided excellent technical support. This material is based upon work supported by the National Science Foundation Graduate Research Fellowship under Grant No. 1144247 to DSH. SEB is supported by the Heidrich Family and Friends Foundation. Proconvulsant effects of antidepressants — What is the current evidence? Chemical databases: curation or integration by user-defined equivalence? The Generation of a Unique Machine Description for Chemical Structures-A Technique Developed at Chemical Abstracts Service. How should we construct a catalog of drug indications?